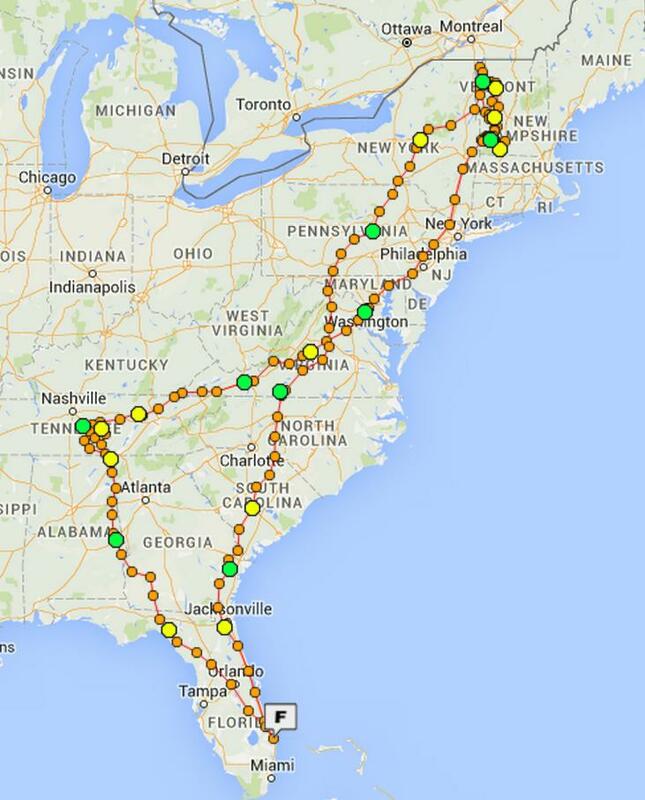 On June 16th, 2016, I embarked on another cross-country summer tour to New England. This tour was be much less ambitious than my previous tours have been. The primary destination was the Motorcycle Sport Touring Association’s national rally called STAR2016 at the Stratton Mountain Ski Resort near Bondville in southern Vermont between June 25th and 30th. Along the way from Florida to Vermont, I first visited friends Ken and Vicky Gill near Nashville, TN and then family members Morrie and Holly Hoven in Alexandria, VA. I had initially met Ken and and Vicky when I attended a TriSTAR rally in Sparta, NC for the first time in 2011. Prior to my departure, I had considered traveling into Quebec Canada with a ride from Montreal eastward along the northern side of the St. Lawrence Seaway and crossing by ferry to the southern side to return into New England. However, instead I decided to return home. This decision was precipitated by the failure of my very new Canon SX710hx camera, since I generally take several dozen photos every day during my tours. I arrived home on July 5th. 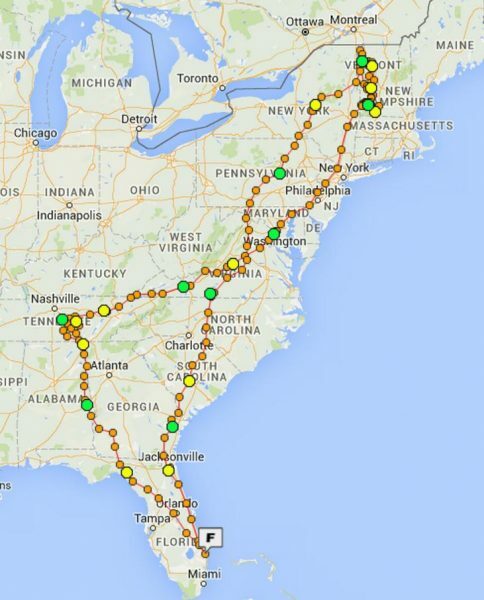 Once again I rode my 2015 BMW R1200GS-Adventure motorcycle on this tour. As during my previous journeys, I had planned on posting travelogue updates to this website along with sending out notices to those on my contact list. From past experience, these updates and notices may be several days after a day’s travel or other events have taken place. Due to the number of activities and limited time, I soon decided to wait until after my return home to prepare the reports. During the tour my Spot Messenger device sent location updates to the Spotwalla web service to track my path and show my current location during my journey. This next graphic shows my completed track. As I complete my travelogue entries, they will become accessible in chronological sequence by clicking on the underlined link in the following list. Links at the top of each travelogue page will move you to the prior or subsequent travelogue report. At each stop along my tour, I’ll add the corresponding entry with its date to this list, but several days or weeks may pass until I prepare the travelogue report and the link becomes available. Thanks for your interest in my motorcycle journey.